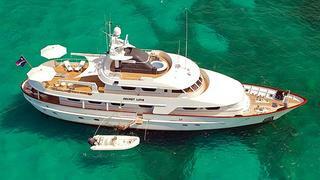 William Molloy at International Yacht Register tells me of a €1.5 million price cut on the 36.5m motor yacht Secret Love. Built by Amels in 1990, Secret Love had a major refit in 2005/2006. MCA compliant, her classic maple wood interior was designed by Struik & Hamerslag, and she accommodates eight guests in four staterooms. Twin 680hp Caterpillar engines deliver a cruising range of 4,000 nautical miles. Privacy, elegance, clean lines and a traditional canoe stern make this yacht a modern-day classic meeting the needs of her owners and the potential requirements of charterers alike. Equipped for comfort with modern stabilizers, guests can visit many of the best locations on offer today.